In response to the recent trailer for Seth Rogen’s upcoming The Interview (which looks amazing), Kim Jong-un released a statement from Pyongyang condemning the film. Okay, that makes sense, as I wouldn’t like a film about my death either. Then, he went so far as to call the movie “an act of war” and that America would be in big trouble if they supported it. It is probably important to note that Seth Rogen co-directed The Interview with Evan Goldberg, and it is probably even more important to note that Rogen is actually Canadian. His response is purposefully a little cheesy, but it’s also the best thing he could have possibly said to Dennis Rodman’s BFF. Seth Rogen is a comedian, and during a bad time, a comedian’s job is not to run towards the chaos but rather to laugh in the face of it. Laughter gives power to the powerless, because even the best comedian knows that they too are defenseless in the grand scheme of things. I am not an expert in foreign relations, but I can tell you that North Korea’s regime is one of the most frightening out there, mostly because it is shrouded in mystery. While Bin Laden would release videos of himself ranting against the western world, Kim Jong-il would simply put on a pair of sunglasses and silently smile as his million man army marched past him. Forgive me for sounding like an idiot, but constructing a joke might be the closest thing we have to figuring out life’s biggest mysteries. Now, when I hear Kim Jong-un issuing a huge threat, all I can imagine is this, and it makes all of the fears of a possible World War III go away. Then I can go back to living my life and look at pictures of French Bulldogs on Tumblr. It is similar to how Team America forever associated Kim Jong-il with a mispronunciation of the word “lonely.”* Sure, Kim Jong-un could act on his threats, but I doubt he would kickstart the apocalypse over a comedy starring James Franco. Recently, John Oliver said in an interview that he didn’t fear calling out dictators, because they probably don’t watch his show anyway. The former part of his statement is true, but the latter may not be. After all, men like Kim Jong-un and Bashar al-Assad may be morons, but they are also egomaniacs with too much power. I am sure they have somebody checking their Google Alerts for them. This is exactly why we need people like Seth Rogen, John Oliver, and Matt Stone & Trey Parker. They drag these elusive figures down to a human level by showing what buffoons they truly are. Kim Jong-un probably fancies himself King Arthur, but he’s more like King Joffrey. So Seth Rogen and Evan Goldberg: do not be afraid. You are not “gangster filmmakers,” but rather good men using comedy to perform a public service. Oh, and this is probably the best free publicity that Seth Rogen could have asked for. 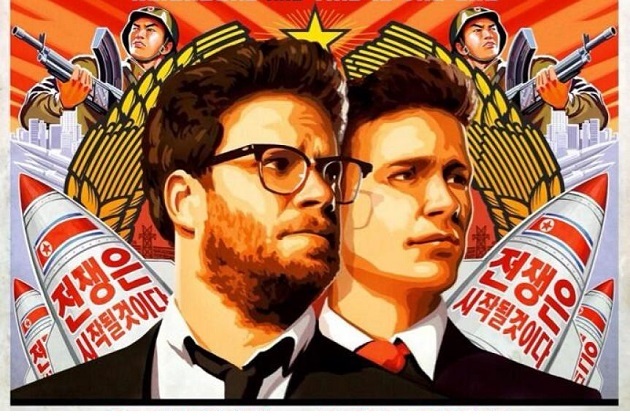 Thanks to Kim Jong-un, The Interview will probably open number one at the box office. See? Even bad press that might lead to war can be used to increase revenue! P.S. Kim Jong-il was famously a huge film buff who was obsessed with Hollywood movies. He even wrote a book on the subject, entitled On the Art of the Cinema, which you can buy on Amazon. *Hey, Kim Jong-il never complained about that once. Also, Team America doesn’t get the credit that it deserves. This entry was posted in Uncategorized and tagged Evan Goldberg, James Franco, John Oliver, Kim Jong-il, Kim Jong-un, Last Week Tonight, Matt Stone, North Korea, Seth Rogen, South Park, Team America, The Interview, Trey Parker on June 26, 2014 by ian0592.